I play Bunco/Bunko, and I have a wonderful time. If you aren't familiar with this game, it is a dice game that requires 12 people (usually women) to play. I just so happen to play with an awesome group of ladies. And, as you all know, Mother's Day is right around the corner. So, I have made each lady a 'Happy Mother's Day' card, and a book mark. I made the book marks out of mega paper clips, and in a variety of colors. That way, each lady could select their favorite color. (I also included a close-up). At the centers of the flowers on the book marks, there is a silver brad to hold all the layers of card stock (petals) together. Some of the centers have clear rhinestones on top of the silver brads, and others have half-pearls. Just in case you wanted some bling, or not. 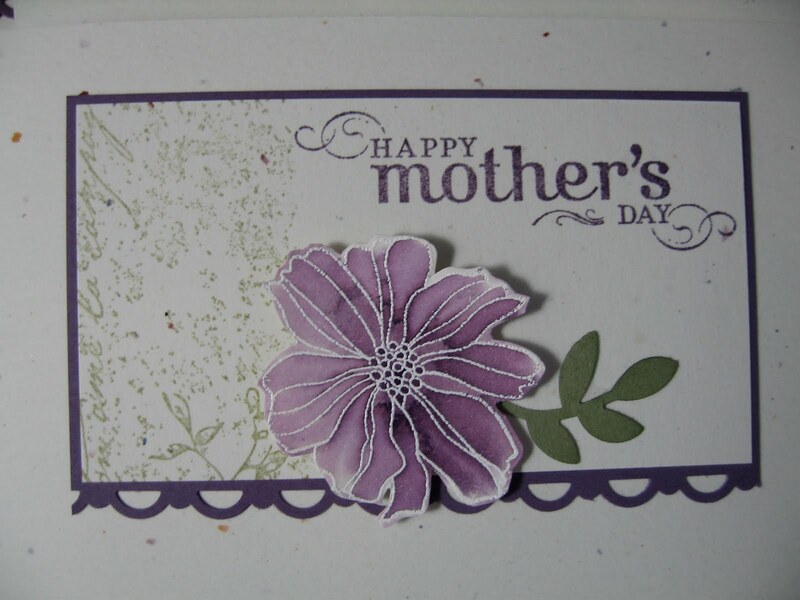 All the Mother's Day cards are the same -its easier when mass producing. However, one lady we play with doesn't have children. I didn't want her to feel left out, so her card say 'for you'. So she knows that she is valued and loved, even if she's not a mom. All products used are stampin' up! 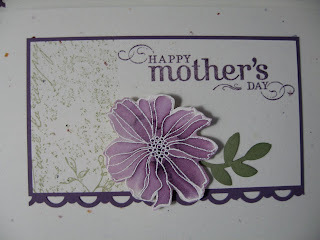 I used Pale Plum & Mellow Moss card stock and classic inks. The flower for the cards, is from the 5th Ave. Floral stamp set. I did the 'water wash' technique on them. If you have any questions, please post it here, or email me.